Halloween 3 – It’s Getting Regular! As I mentioned in Friday’s post about zombie walks, on Saturday we had a Halloween party. In fact it was our third annual Halloween party since moving to Australia. Halloween parties are definitely now our thing. But this Halloween party was the first to feature our brand-new “Gin Table”, which you also already know about from Friday’s post. We were real excited about that! Although as the guests arrived, I still hadn’t got it out of the box. Not that I was running behind schedule or anything. 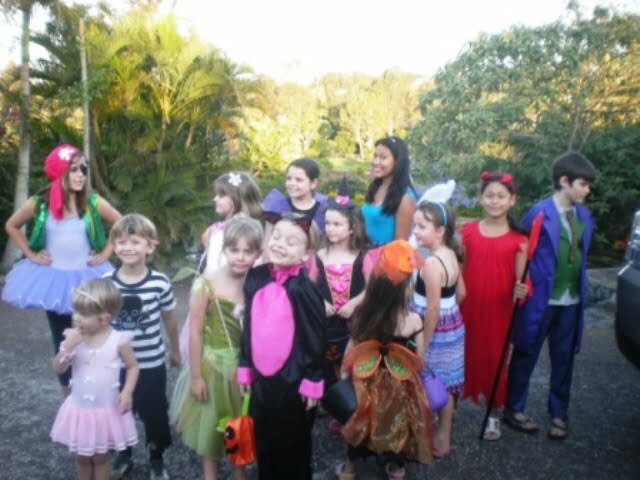 As usual, the kids just loved the dressing up part and the trick or treating. Here they are returning from terrorising the neighbourhood and collecting booty…. After they had finished explaining how many lollies (that’s Australian for sweets) they’d managed in their haul, I got them to hit me with their best pose…. Then they went off to take part in the party games, among them were bobbing for apples and beating the pumpkin piñata to a pulp before collecting yet even more sweets. Now pumped full of E numbers, it was time to unleash them into the garden whilst us adults relaxed back and hit a few beers. By 11:30 PM, the final guests had gone, not a bad effort considering we started at 4 PM and almost everybody had young children with them. Mrs BobinOz could finally really relax after having worked so hard putting the party together. She had done a fantastic job and the choice of three meals; chili con carne, prawn curry or the lasagne, went down a treat with everyone. Well, not the kids, they were overfull with lollies and cake. Next post: Traffic Chaos in Brisbane? Clogged Roads? Try This…. Previous post: Australian’s are Strange People, or is it just a Bizarre World?